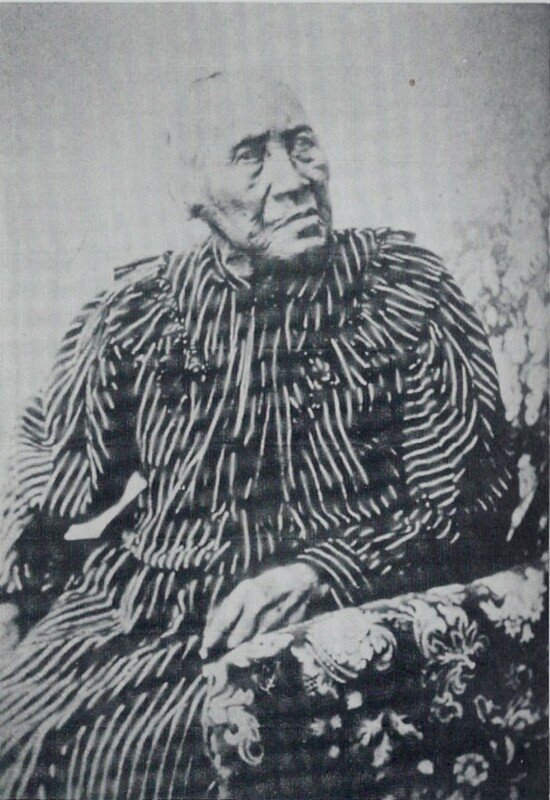 In the final years of her life, Zerviah Gould Mitchell was recognized for her contributions towards advancing the cause of Native peoples in Massachusetts. Residing with her daughters Teweeleema and Wootonekanuske (Melinda and Charlotte Mitchell) at Betty's Neck in Lakeville, the elderly Mrs. Mitchell attracted numerous visits from journalists, authors, artists and photographers keen to document what they termed the "last of the Wampanoags". Among them was Walter Gilman Page who arrived in Lakeville in 1890 to paint Mrs. Mitchell's portrait and who penned the following account which appeared the following year in New England Magazine. Few people are aware that there dwells within the borders of the old Bay State a lineal descendant of the great and good Massasoit, and the last of the Wampanoags. Sharing the growing interest in all that pertains to the early history of Massachusetts, as well as being desirous to gratify my own curiosity, I was recently led to take a trip to Lakeville, Mass., the home of Mrs. Zerviah Gould Mitchell, the last of her race and family, in order that I might paint her portrait. I found Lakeville to be a quiet, staid township, with homesteads occupied by people descended from good old Puritan stock, still clinging to the abodes of their ancestors in spite of the temptations of the West, or the great cities of the East. The place is beautifully situated, and it abounds in Indian legends and Indian battle grounds. The road by the village skirts the shores of Lake Assawamsett, as picturesque as its name. At a distance of five miles or thereabouts from the village, one leaves the main road and turns off into a lovely winding woodland lane, by a rippling brook, and further on an old dilapidated sawmill. A mile or so, and a sudden bend brings you to the cottage door, where Mrs. Mitchell accords you a pleasant welcome. The rough habitation is most picturesquely situated; they seem to possess an intuitive sense for such things, these people, east or west. From the doorway you look out over a field of waving corn; beyond that the line of the woods; and if the trees did not grow so thickly, you might catch glimpses of the placid bosom of the lake. Nothing disturbs the profound stillness which reigns about, save the cry of the blue-jay or the distant tinkle of a cow bell. From time immemorial have the Wampanoag tribe dwelt here on the Assawamsett Neck, though but for an act of Governor Winslow they might have been wanderers on the face of the earth; for it was he who ordered that the Neck should be a reservation for the Wampanoags, they and their descendants, forever. I had some doubts as to the success of my request, but Mrs. Mitchell granted a ready acquiescence; the fact of her having been photographed several times had doubtless somewhat paved the way for me. Hers is a strong face, somewhat masculine, but full of intelligence, lighting up in conversation, particularly if relating some of her wrongs at the hands of the pale-faces. I passed a half hour in agreeable that, taking mental notes the while of my surroundings. The room was evidently a place where one could eat, drink and be merry; since it was kitchen, dining-room, and containing a piano, which was certainly a surprise could, I suppose, be called a music-room. A door leads to an L containing the sleeping-rooms, one on the ground floor, in which I painted the portrait, and the other above, reached by means of a Jacobs ladder~ as Mrs. Mitchell facetiously termed it. All arrangements were happily made for sittings, and I was to begin the following morning, much to my gratification. The next day, instead of driving, I took a boat and rowed to the Indian shore, as the residents called the narrow strip of beach, from whence a path leads up to the Indian encampment. Not being familiar with the locality, I spent considerable time in seeking a landing-place, but my opportunities for enjoying the lovely panorama which the shores of the lake present were thereby increased. I was finally obliged to invade a camp of pale-faces, and inquire my way of a young and pretty girl. The Indian matron was awaiting my arrival, and the pose was soon selected and work commenced. As we grew better acquainted, many were the legends and tales of both Indians and whites, all of them most interesting, which she related to me, the while holding her position with remarkable steadiness. Mrs. Mitchell was born July 24, 1807, and her parents were Brister Gould and Phebe Wamsley. Her mother was daughter of Wamsley and Lydia Tuspaquin; Lydia descended from Benjamin Tuspaquin, son of Benjamin Tuspaquin, or otherwise called the Black Sachem and one of King Philips most able generals. He married Amie, whose Indian name is lost to us, youngest daughter of Massasoit, chief of the powerful Wampanoags. Thus Mrs. Mitchell is the great-great-great grand-daughter of Massasoit. She is also descended from John Sassamon, the well known Christian Indian, who became a preacher to the Indians, under John Eliot. Having warned the Puritans of King Philips designs upon them, he was soon after murdered by his countrymen for his treachery to their cause. Educated in the public schools of Abington, and afterwards at a private school in Boston, in which city she has also taught a private school, Mrs. Mitchell fully demonstrates in her own person the educational possibilities of the Indian. Her memory is remarkably clear upon This genealogy is carefully and fully traced in a work by Gen. E. W. Peirce, entitled, Indian History, Biography and Genealogy, pertaining to the Good Sachem Massasoit, of the Wampanoag Tribe, and his Descendants. This work was published by Mrs. Mitchell in 1878, at North Abington, Mass., and contains a preface written by her, the incidents of her schooldays; as in fact it is upon all the events of her life. At the age of seventeen she married Thomas C. Mitchell, by whom she had eleven children, five of whom are still living. Two of her daughters live with their mother, supporting themselves by selling their farm produce, making baskets, moccasins and so forth. Another daughter lives in Ipswich, Mass., and the only surviving son works in a shoe shop in Abington. Mr. Mitchell died in East Fall River in 1859. Mrs. Mitchells eyesight is more remarkable than her memory, for she reads and writes without the aid of her glasses, and I have in my possession her signature, written in a clear, legible hand. I was sorry indeed to part from this romantic environment; for what could be more charming than this quiet spot in the midst of such natural surroundings, listening to the tales of bygone days when Puritan and Wampanoag struggled for supremacy? Before I left Lakeville, I visited the old Indian burying-ground; but it is now difficult to recognize it as such, since all the stones have suffered mutilation at vandal hands. Even the Indians graves are not respected, and she who remains is but a solitary figure amidst the rush of invasion, the only type of a race which has now almost vanished from New England. Walter Gilman Page, New England Magazine, “A Descendant of Massasoit”. January 1891, 642-644.